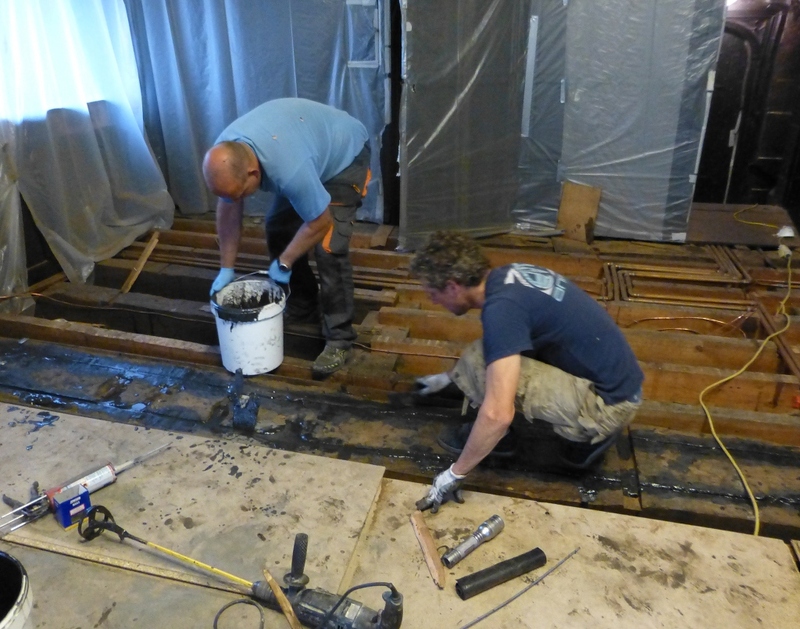 This case study shows a challenging repair to an oak beam using angled slots, carbon fibre and TG6 timber grout. Chetham’s Library, which was founded in 1653, is the oldest surviving public library in Britain. 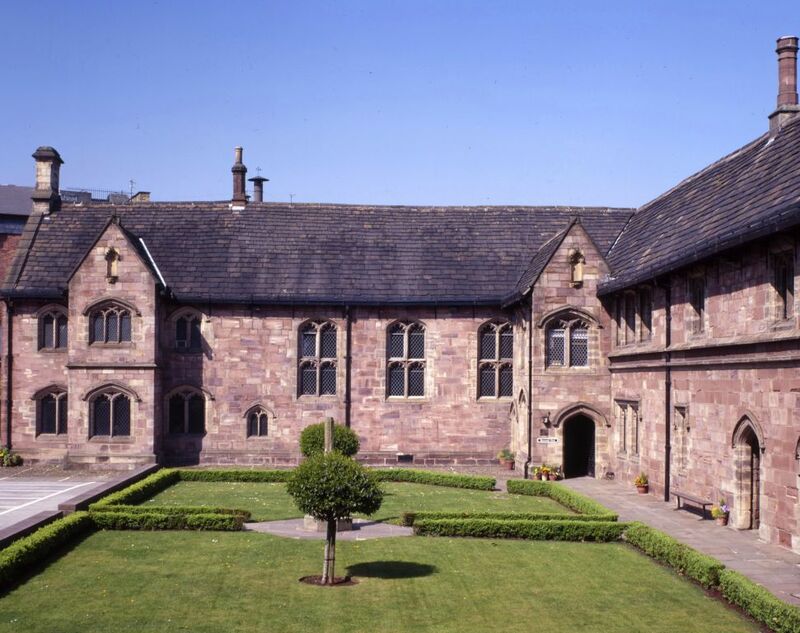 The building that houses Chetham’s is even older than the foundation of the School and Library. 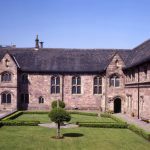 It was built in 1421 to accommodate a college of priests and remains one of the most complete medieval complexes to survive in the north west of England. The beautiful old sandstone buildings house a magnificent Library. The Audit Room was one of the rooms allocated to the warden of the medieval college, this is one of the most richly appointed in the building. 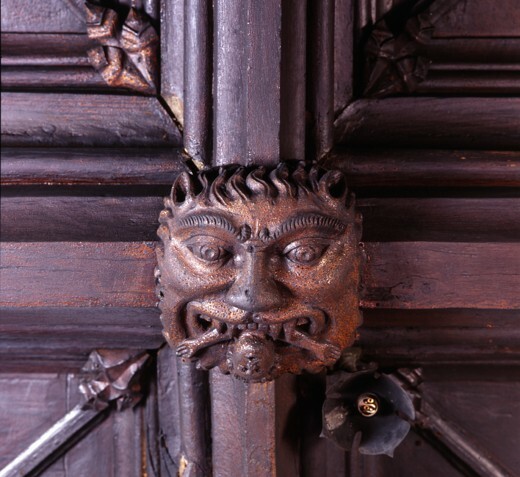 The most notable decorative feature is the timber ceiling, divided into nine panels by moulded ribs decorated with bosses including some with grotesque designs and an impressive Mouth of Hell mask with a sinner ensnared in its jaws. Each panel is divided by diagonal ribs. The design is consistent with a date from the first half of the fifteenth century, and there are some similarities with the panels in the roof of the Cathedral. 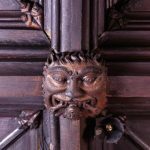 Rotafix were approached by Alan Jackson of David Walker Design for assistance in designing a reinforcing solution for the carved oak beams that support and adorn the ceilings in the Audit Room. 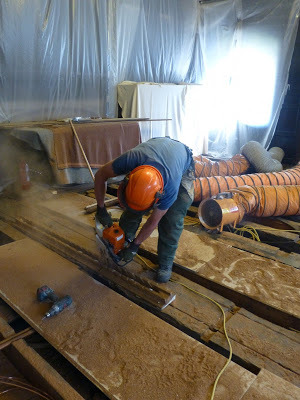 One of the oak beams had failed under loading as the integrity of the beam was compromised by infestation and decay. A number of attempts have been made to repair, strengthen and reinforce the beam. The first of these was an iron pin that had been inserted into the beam from the underside in approximately 1650 that would have pulled the beam back together. Between the Wars, steel reinforcing plates were screwed to either side of the beam to add reinforcement. The image below shows the view from the Audit Room. The extent of the damage can clearly be seen, along with the horsehair and plaster which has been used in previous repair attempts. Rotafix determined that the integrity of the beam should be restored using Rotafix TG6 Structural Grout and that it should be strengthened by inserting Rotaflex carbon fibre plates as close to the tension zone as possible. 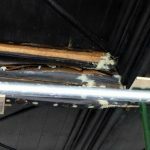 English Heritage insisted that the repair should be invisible and not disturb the repairs that had been attempted previously. Rotafix approached Simon Chen of TRAC Structural, a company with extensive experience in using Rotafix methods in historic buildings. Rotafix worked with TRAC Structural to develop a practical approach to make the recommended repair. 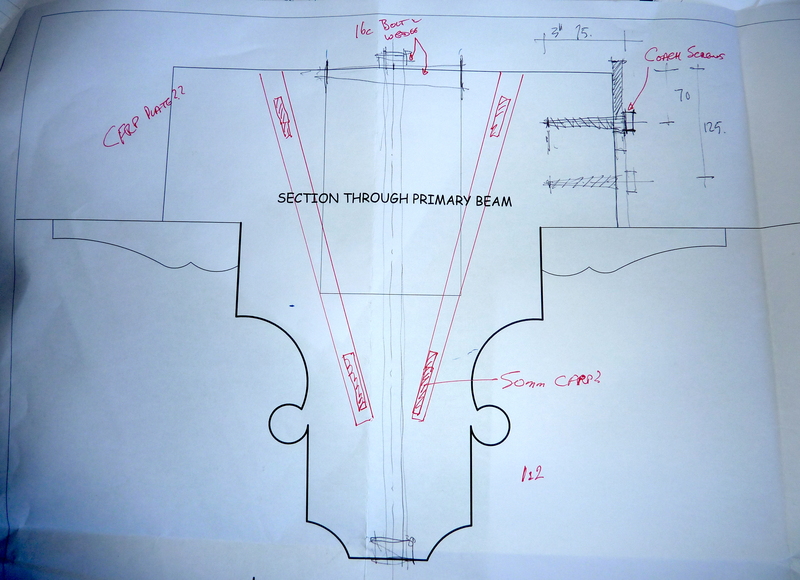 Rotafix and TRAC Structural developed a method statement and created sketches that were approved by the Trustees of Chatham Library and English Heritage where slots would be cut into the top side of the beams. The slots would be angled to avoid the coach screws of the plate repair and stop short of touching the iron pin inserted in the centre line of the beam. 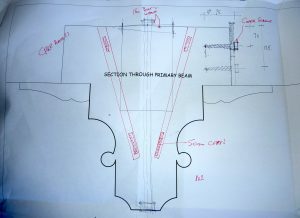 TRAC Structural cut slots using a chainsaw controlled by a jig that was attached to the beam at the exact angle required. Rotaflex Carbon fibre plates were inserted into the slots and then filled with Rotafix TG6 Structural Grout. The grout cured overnight strengthening and reinforcing the beam. Thirteen tubs of grout, each containing 7.5 litres, were used to complete the job. 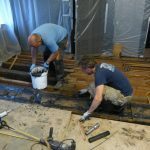 The TG6 Structural Grout filled the voids consolidating the timber and acts as the adherent between the timber and the Rotaflex carbon fibre plate. Rotafix TG6 Structural Grout is a two part epoxy heavily filled with fine silica fillers. 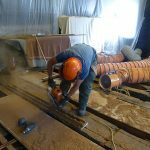 The fillers add excellent compressive strength of the grout so any areas of the beam working under compressive loads are given additional reinforcing. The Rotaflex carbon fibre is excellent in tension and is ideal in this application as it is only 2mm thick and would require a glue line of 2-4mm on either side of the plate, this minimises the timber removal from the beam. A 2mm thick carbon fibre plate has a tensile strength of 160,000 N/ mm2. So this would be a significant increase in strength for the beam. 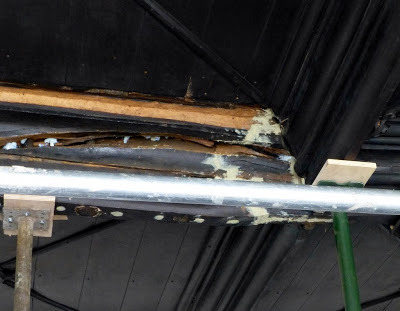 Hiding the carbon fibre internally ensured that the beam did not lose its aesthetic appearance and would be invisible when compared to the other beams in the library from the underside. Rotafix are able to provide comprehensive technical support for architects, structural engineers and contractors carrying out repairs to historic buildings and features.